I first heard of Elite Shungite when I was at a crystal expo and was attracted to it’s shininess. After learning more about all the amazing benefits, I bought a little piece for myself and started putting it in my daily water bottle. I then did more research online and was very surprised and happy to see so many others doing this and their positive experiences. I ended up ordering some more online and now I have two gallon water dispensers that I allow my Elite Shungite to sit in, in my pantry, for days to weeks to get the most effective detox. 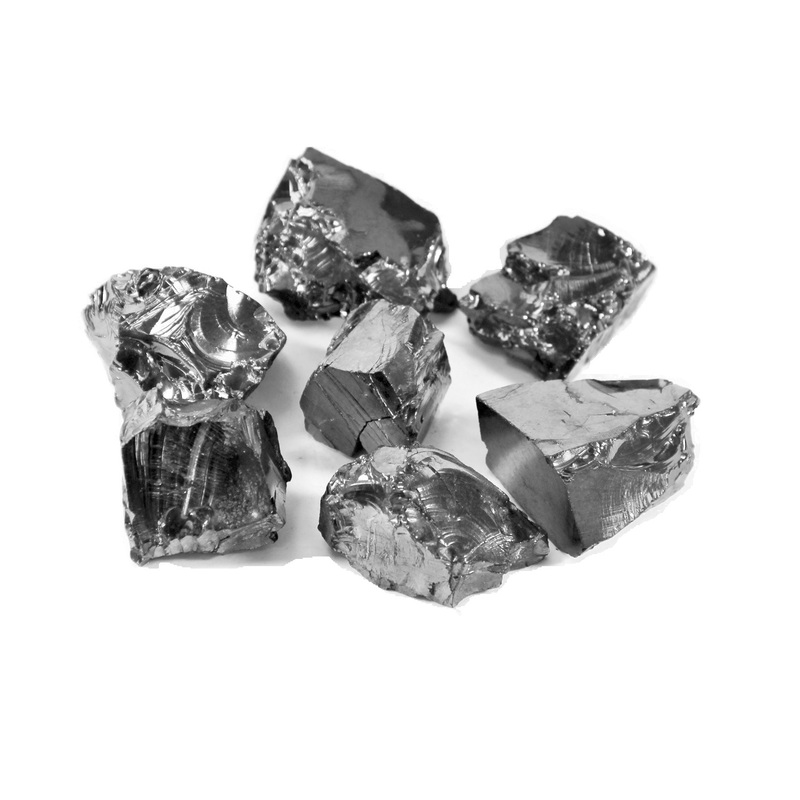 Our Elite Shungite transforms water into a living substance, while also removing harmful pollutants. Research has shown that Shungite absorbs things that may be hazardous to health, whether it is pesticides, free radicals, bacteria and the like, or EMF, microwave and other vibrational emissions. It boosts physical well-being and has a powerful effect on the immune system. Shungite infused water is traditionally drunk two or three times a day to eliminate free radicals and pollutants, as an antibacterial and antiviral, and for prevention or lessening of the symptoms of the common cold and other diseases. Shungite is widely known as a natural filter, helping to clean and mineralize water. Shungite water provides a positive therapeutic effect and helps with a great number of diseases including skin related problems, chronic respiratory issues, headaches, aches in joints and muscles as well as the problems with the digestive system. Shungite water is known for its antioxidant effects. In order to make shungite water you need to carefully wash shungite stones before using them to get rid of any post-production dust and dirt. The difference between regular shungite and elite or noble shungite is in the proportion of organic carbon in it. Regular shungite contains from 35 to 60 per cent of organic carbon while the percentage of carbon in elite shungite is much higher and totals from 92 to 98 per cent. Due to this reason elite shungite is more efficient in making energized water since it has a higher energy potential as a stone of highest compound of fullerene carbon. In order to make shungite water infuse elite shungite stone(s) per one liter of water for two or three days and drink it fresh. Shungite starts filtrating water within first few hours, but the more you keep shungite in the water, the more benefits you will receive. Stones are supposed to be cleaned and charged regularly. Elite shungite water is water infused with elite shungite nuggets of different fraction sizes. Elite or noble shungite stones are known for their shiny silvery surface and high percentage of carbon. Elite shungite water stones absorb more than 95% of water polluting elements, mineralize it and add a number of therapeutic effects. After filtration with noble shungite nuggets it gets its own powerful energetic field letting you to keep body and soul in harmony. 1- First thing you need to do when getting your shungite is to cleanse it. In Russia they recommend to boil water and then place the shungite there to clease it even better. It is up to you what method you want to use, I have never boiled shungite in water and use the brushing, but if the shungite you get (from other sources than us) is really dirty, the second method is recommended. 2– In a large glass jar place 1 to 2 gallons of water and add 8-12 pieces of elite noble shungite per gallon. Or add just one stone to your daily drinking water jug. Let it rest for at least 4-6 hours (minimum) then you can start drinking the water. When you have almost finish the water, at night time before going to bed refill the jar with new water and let it with the shungite overnight. Next day it will be ready for you to drink. “One of the questions I get asked often as well is about shungite being acidic for alkaline for water. Conclusion. Shungite is grounding. It is a good stone for those who are ready, need or want changes in their lives. Shungite will help push you towards those changes. As for Shungite water…It definitely works at combating EMF and calms the environment down. As for the gradings and effectiveness. Elite Shungite maybe the prettiest but it is also the most fragile and shatters easily, so handle gently. IF for any reason it breaks, still work just as effective. Still want to learn more about the miracle stone? Click here for a great book on it. Are You a Small Business Owner Looking to Network?